The wallflower of the audio world. The debate about whether DACs (Digital-to-Analog Converters) actually make a difference to your sound is still one that has yet to be resolved. And while we at TMS come squarely down on the side of “Yes, DACs do make a difference, now please shut up,” the OL DAC from JDS Labs isn’t going to convince the doubters. In this review, we break down the OL DAC’s sound, design, packaging and accessories, specs and more. To see alternatives, read our list of the best DACs. Hoo boy. OK. Here’s the thing about the JDS Labs OL DAC: it doesn’t actually sound like anything. To explain why, we need to do a brief primer on what DACs are (if you know this already, skip to the next section). In almost all cases these days, we play music from digital files. Very obviously, these exist as a series of ones and zeros. You can’t hear ones and zeros – or if you can, please drop us an email and let us know your secret – so you need to convert them into actual electrical signals that can be transmitted as soundwaves. To do this, you use a Digital-to-Analog Converter, or DAC. The higher the quality of the DAC, the better the conversion, the smoother the sound will be, and the less chance you’ll have of hearing glitches and artefacts. The DAC in your phone is quite a bit worse than external DAC like the one in question here. The big debate in the world of audio, of course, is whether the difference is too subtle to hear or not. We firmly believe it’s audible. We are firmly of the belief that DACs make a difference to the sound. It’s not something that someone just getting involved in the world of audio equipment is going to be able to pick up. But spend enough time around amps and DACs, and you’ll definitely start to hear the differences between versions of the latter. They are subtle, the kind of things that hum in the background, never really appearing unless you focus on them, but they are definitely there. Even super-expensive models, like the Benchmark DAC3 HGC (full review here), do that, and it’s priced at $2,195 - roughly twenty-one times the cost of the OL DAC. And if we are going to stick to this metaphor, turning audio into a party with all sorts of sound signatures milling around and getting drunk on cheap punch, then the OL DAC is a wallflower. No, scratch that, it’s not just a wallflower. It’s a wallflower, in the kitchen, petting the dog and refusing to talk to anybody. The difference it makes to the sound is so subtle that it may as well not even be there. While it certainly succeeds in the job of converting audio from ones and zeros into actual electrical signal – there’s absolutely no doubt about that – it adds virtually nothing to it, refusing to color it at all. In a way, that’s not a bad thing. All DACs are subtle, in their own way, but if you’re the kind of person who wants to experience nothing more than what the musician intended, hearing everything as it was when they first played the notes, then you don’t want your equipment to affect the sound in any way – or at least, you want it to affect the sound in ways which are virtually unnoticeable. In circumstances like that, this DAC makes perfect sense. If you do something like pair it with company’s Objective2 (full review) – an amp that takes aggressive neutrality to an extreme, simply boosting the sound while point-blank refusing to alter it in any way, shape, or form – you simply reinforce the neutral quality of the sound. This is one of the few cases where a DAC not contributing any coloration at all is a very good thing. Its slightly different to something like the Schiit Modi 2, which definitely makes its presence felt in a subtle way. The base models of those two DACs, by the way, are identically priced at $99 - you'll need to pay extra for your Optical inputs. Having said that: if you want to convince someone that DACs make a difference to the sound, as opposed to simply performing a basic conversion function, then this is not the DAC to choose. That subtlety will be your enemy, and if you enjoy creating a sound signature for the music you listen to, sharpening it and polishing it with each successive piece of equipment you use, then this is going to be a nonstarter for you. One of the functions of DACs – and the reason why external versions are advocated over those located in your phone, or tablet, or laptop – is the removal of artefacts and glitches associated with conversion. The better the technology, the smoother the resulting audio will be. It must be said that this kind of thing is incredibly hard to judge without the right kind of testing equipment; we don’t have that equipment – it’s nice to own, but fundamentally not very useful for the majority of our readers. In this case, we are unable to tell you much about its conversion capabilities, beyond saying that whatever we put through it came out sounding clear and full. We listened on multiple sources, from Spotify streaming and CDs to compressed MP3s, and in all cases, we heard more or less what we expected to. A/B testing it with the converter in our laptop, paired with the Objective2 and a pair of MEZE 99 Classics (full review here), we found it was hard to tell the difference. It was clearly converting things, but we would be lying if we said we could detect anything but utter and total neutrality. Again: there’s nothing wrong with this. It’s simply one approach to conversion technology. But if you’re in the market, it’s definitely worth being aware of. For the record, the OL DAC can take file formats of 16 bit / 44.1kHz through 24 bit / 192kHz on Optical, and 16 bit / 44.1kHz through 24 bit / 96kHz. There’s no DSD functionality. We’ve already reviewed two JDS Labs amps - the boxy Objective2, which we’ve mentioned already, and the absolutely stellar The Element (full review). The Objective2 is based off an open source amplifier design, and it shares a very similar chassis to the OL DAC. It’s a boxy, almost industrial design, with tough black metal scored with low, slightly textured fins. Although it’s far from the most eye-catching piece of gear available, it does have a reassuring sturdiness to it. In addition, if you get it with the Objective2 – and as we shall demonstrate, there is every reason to do so – you’ll find they are both stackable, slotting nicely on top of one another. It’s a good look. DACs can be complicated, but the OL DAC definitely isn’t. There are minimal controls on its blocky body, and it’s the work of moments to set up. Once you’ve plugged it into the mains – it doesn’t draw power from USB – all you need to do is connect your computer via the included USB cable, or another source via the optical connection. Attach the OL DAC to an amp via the RCA out, selector input, and you’re done. That’s all there is to it. The only actual controls on the thing are the input switch and power button, round the front. The only ornamentation is a single LED, which turns green when the DAC is on. And that’s it. That is the design in its entirety. And outside of the product name and the company logo in subtle, white font on the front, it’s a distinctly low-key product. Nothing wrong with that, of course, but if you’re looking for more options or a little bit more pizzazz, you may want to look at something like the Chord Mojo (full review here) – although bear in mind that you will certainly pay for the privilege! It must be said that we do love the fact that there is an optical input here as one of the options ($139 for Optical and USB, $99 for USB only). It’s starting to become more and more common among DACs in this price range, but it’s still nowhere near a given. And in terms of design, there’s no denying that the OL DAC works very well indeed: incredibly simple to use, easy to set-up, and perfectly functional. It’s a design that worked very well with the Objective2, and it works very well here. Hardly worth a write-up here! Like the DAC itself, it’s very basic. You get the only real accessories you need to get things working: a wall wart and power cable, and a USB cable, three feet long, allowing you to connect this directly to a tablet or computer. While it would be nice to see an RCA cable included here, it’s hardly a deal breaker, as you can pick a very respectable one up for a few bucks at your local drugstore. The packaging is a very simple cardboard box, with minimal frills. It’s all in service of keeping the price down, which is something we wholeheartedly support. The OL DAC has solid build and functionality, including an optical input. The sound quality is good, with neutrality being the name of the game. ​It’s a very affordable desktop DAC option, starting at $99. The OL DAC isn’t going to suit those who like a little life to their sound. The DAC has unexciting design, which blends into the background. ​There are arguably better DACs available in this price range - see below. The Schiit Modi 2 is the most obvious comparison. Both it and the OL DAC cost the same ($99), have similar inputs and outputs, and do very similar things. If they were to go head-to-head, we’d have a hard time recommending one over the other. Perhaps the most obvious difference is that the Modi 2 does have a very subtle sound signature, which is noticeable if you listen hard enough. It’s not leaps and bounds over the OL DAC, but it’s there. Worth bearing in mind: Schiit recently released a third version of their Magni amp, and it’s a sure bet that a similar upgrade to the Modi is imminent. Watch this space. Then there’s the Optoma NuForce uDAC5. We have a real soft spot for this one. An old review model still resides in our office; while we do regularly sell our old reviewer equipment, so far, nobody has bought this from us – a crying shame, given how good it is. It handles DSD, has a silken, addictive sound, a decent headphone amp, and great usability. While it would be nice if the price dropped a little, we still think it’s one of the best DACs currently available. It is however double the price, at $199. A less expensive option: the FiiO K1. This is arguably the cheapest decent quality DAC on the market. At a mere one cent less than $40, it’s only barely above the conversion chips in your phone. But it does its job well, and it looks good. Not only does it come with a headphone amp – unlike the Modi 2 and OL DAC – but it’s also absolutely tiny, barely the size of a credit card. If portability is more your bag, then this is the one to go for. 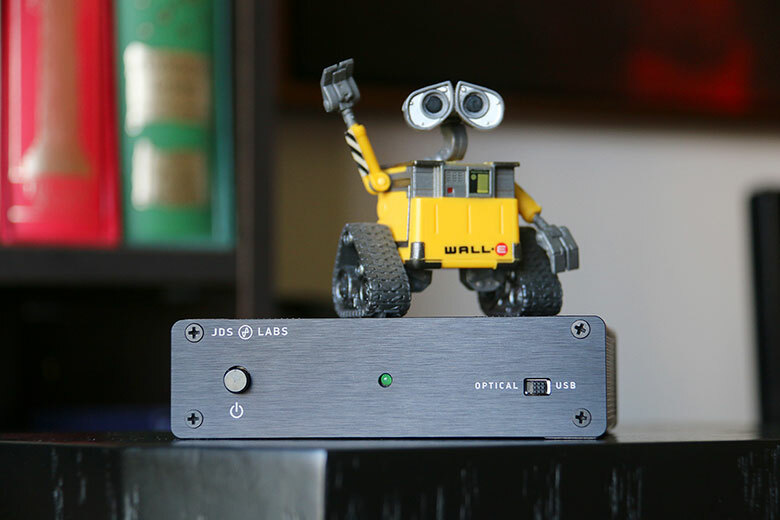 JDS Labs make a slightly more exciting DAC, too - in design terms, if not in sound. The EL DAC has the same design as their The Element amp, and looks absolutely fabulous. It’s more expensive, at $249 to the OL DAC’s $99, but the stellar design and the identical inputs mean its ideal if you want something more eye-catching. If we’re being honest, the sound differences between the two are very minimal; you’re looking at changes so subtle you’d need scientific instruments to hear them. If you don’t care about the looks, get the OL DAC. You won’t be missing out much. And the OL DAC really is the silent assassin of the audio world. It gets in, does the job, and gets out. Assuming nothing goes wrong, you’ll never know it was there. For some people, that’s enough. For some, the idea of audio equipment that simply sends a signal where it’s supposed to go, without adding any kind of color or character, is an attractive one. And while we like our equipment to have a little bit of a personality, that’s very much a personal thing. There’s a place for the OL DAC in the audio world. Pair it with the Objective2 amp and a particularly revealing pair of headphones, like the Sennheiser HD600, and you’ll practically be in the studio with the musician and the mix engineers. We must admit, that’s quite an appealing prospect. It’s not a particularly exciting piece of gear. It doesn’t get the pulse racing. Its build, accessories, and mission are as basic as it gets. But on balance, we like it. It’s not going to win the DAC argument for us, but then again, we’re sick of the DAC argument. It was stupid before, and it’s stupid now. The debate should be about whether or not DACs color the sound; it should be about whether you want them to color the sound. If you don’t, then this should be your first port of call. There are three types of audiophiles: those that find tube amplifiers to be the bee’s knees; those that swear only solid-state amps can produce true-to-life audio; and those that haven’t tried tube amps and are simply missing out. One of the biggest debates in the audio world is whether an amplifier should change the quality of the music, or simply present it as objectively as possible. The JDS Labs The Element can help with that.